I was the sort of child who always had a bunch of brain-teaser and riddle books lying around in her room, and I grew into the sort of adult who enjoys Professor Layton games. The Curse, for me, is a natural extension of that impulse to solve everything. 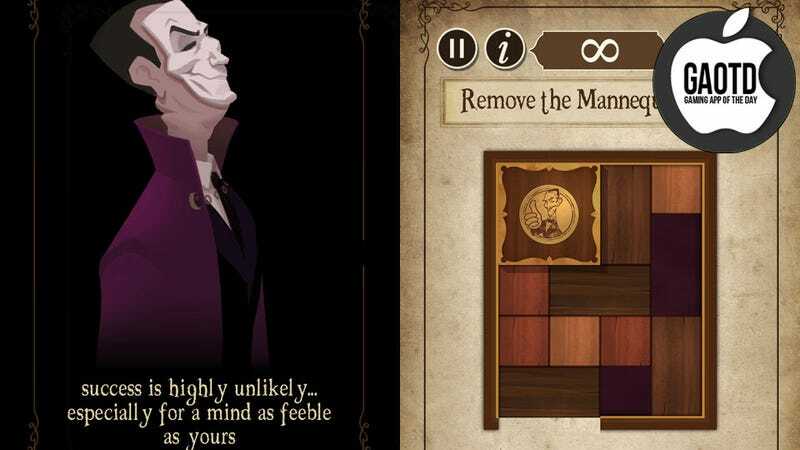 In fact, The Curse could be considered sort of a second cousin to the Professor Layton franchise. It's a series of logic puzzles with a story wrapped around it: you have, in your hands, an evil book. The puzzles are mainly nothing new—tangrams, riddles, magic squares, slider puzzles, and all the rest—but for those who like brain-teasers, it's a pleasant diversion. The most frustrating puzzles are perhaps the ones requiring precise timing; in the midst of working mainly with your brain, having to switch to working with your reflexes can be frustrating. The framing story is silly, but also surprisingly well-executed. When the villain Mannequin "calls" your phone, even if you're actually using an iPod there's something believable enough about it to be worth a chuckle. His "Phantom of the Opera"-style mask and Dracula-esque bearing are charmingly, rather than irritatingly, ridiculous. The structure is fairly forgiving; players can flip through pages of the "book" in order to solve easier puzzles first and build up to harder ones. (We all have our weaknesses; while I'm good at slider puzzles and riddles, the whole "make 4 liters with a 5 liter and 3 liter container" set-up will get me every time, in every game.) Finishing the game requires solving a final puzzle, but access to that puzzle must be earned by winning 20 cogs—one for every five puzzles in the book. Developers MojoBones and Toy Studio promise an Android version should also be available soon.